Long list of failures also includes political interference in public appointments and the TTC's handling of public consultations. 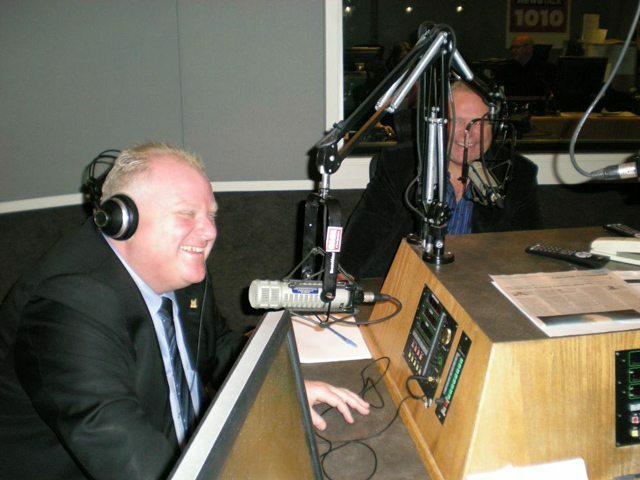 Rob and Doug Ford in the studio; photo courtesy of Newstalk 1010. A string of reports have come out of City Hall this morning—all part of next week’s city council agenda—which in turn criticize the mayor, his office, his brother, another councillor, and the TTC, for a number of infractions and failures on a variety of matters. To help make sense of all the news flying around, here is a handy list. Rob Ford: code of conduct violation. The integrity commissioner, Janet Leiper, has found that Rob Ford violated council’s code of conduct, which says that “no member shall maliciously or falsely injure the professional or ethical reputation [of staff]…nor shall any member use, or attempt to use, their authority or influence for the purpose of intimidating, threatening, coercing, commanding, or influencing any staff member” [PDF]. Ford breached this when he lambasted Toronto’s medical officer of health, Dr. David McKeown, on the radio show he hosts with his brother. McKeown told councillors that they should consider lowering the speed limit, which would save lives. In response, the mayor called McKeown’s salaray “an embarrassment” and described McKeown’s recommendations as “nonsense.” Ford has since offered a retraction. Doug Ford: code of conduct violation. As above, this concerns the episode of the Fords’ radio show in which they discussed the medical officer of health. During that conversation, Doug Ford asked, “Why does he still have a job?” The integrity commissioner writes that “Public name-calling and/or personal attacks on staff can have a chilling effect on the public service.” Doug Ford has not offered an apology, and Leiper is recommending that city council formally reprimand him. Michelle Berardinetti: code of conduct violation. Another investigation into a radio show segment—though apparently not on the Fords’ show. (The report doesn’t specify, but the air date indicates that the call would have been made to Josh Matlow’s show on Newstalk 1010.) Berardinetti was discussing the Toronto Zoo—council has been debating whether and where to move its elephants—and remarks she made about City staff were inappropriate, says the integrity commissioner. The councillor has since apologized. Mayor’s office: interference in public-appointments process. A significant portion of the City’s staff and budget is managed through dozens of agencies, boards, and commissions (everything from the Police Services Board to the Toronto Public Library to the TTC). Members of the public are appointed to sit on many of those boards, and selected by councillors for that job. Last month, Toronto’s ombudsman, Fiona Crean, found that the mayor’s office had interfered with the public-appointments process, trampling on existing City policies (including diversity policies) along the way. She presented that report to council, during which several councillors called her integrity into question. One major point of contention was that her report mentioned that the mayor’s office may have circulated lists of names—that is, that they had distributed their preferences as to who got the jobs to friendly, Ford-allied councillors making the decisions. At the time, Crean didn’t have an actual copy of any such list, and she made no conclusions about whether claims about its existence are true. That list has since surfaced, as she reports in an update released today [PDF]. TTC: failure to conduct reasonable public consultations. After complaints lodged by a residents’ group, the ombudsman investigated the TTC’s handling of projects at two subway stations, Donlands and Greenwood, which were slated to get second entrances added as a fire-safety measure. Crean has found a “series of failures by the TTC to engage in any meaningful public consultation,” and specifically noted that “the TTC did such a poor job of communicating that it left many residents with the feeling that the TTC had already made up its mind, and was not serious about public consultation.” Crean has made seven recommendations for improvement to the TTC [PDF]. This morning, the TTC issued a statement noting that it “accepts and agrees with the Ombudman’s recommendations and acknowledges, without reservation, that these projects were not handled well by staff on two counts” (namely the public outreach and clear explanation of the plans). Both projects are currently on hold. Toronto city council will discuss all of these matters at its meeting next week. UPDATE 2:55 PM: Tensions haven’t calmed in the hours since the reports were first released. This afternoon, the mayor told the Globe and Mail that the real problem lay with the very existence of the accountability officers who’ve been charged with investigating complaints. Saying there were far more of them than needed, Ford told the paper that “You don’t need a lobbyist register, an ombudsman and an integrity commissioner. They have 20 people, they’re tripping over themselves. They’re trying to make themselves look busy.” The positions he listed were created by the City a few years ago, in the aftermath of the Bellamy Inquiry, which looked into the misappropriation of millions of dollars in the MFP computer-leasing deal.